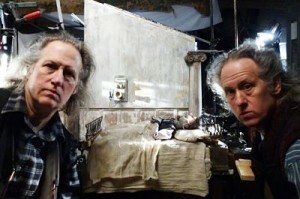 Though the Brothers Quay have been creating their uniquely stylized stop-motion animated productions for nearly 40 years now and can be considered as influential as any other animators to emerge over the past three decades, they’re still outsider artists who aren’t known beyond the circle of those who like their animated stories dark, non-linear and avant-garde. 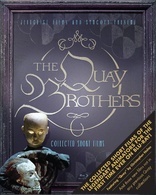 That said, The Quay Brothers: Collected Short Films serves as both a fine compendium for fans of the Philadelphia-born, London-based twin brothers Stephen and Timothy Quay and an excellent introduction for those unfamiliar with the Quays’ inimitable, unforgettable work. Using wildly esoteric source material that ranges from the writers Konrad Bayer, Robert Walser and Stanislaw Lem to the Babylon’s King Gilgamesh to French artist Jean-Honoré Fragonard, the Quay Brothers’ steady output of animated short films featuring puppets, doll parts and all manner of organic and inorganic materials (metallic dust and cotton, anyone?) are actually easier to experience than they are to describe. Set to unconventional, ambient musical scores, they are fluid works of stop-motion animation that play like the underside of a dark dream, uneasy fantasies filled with images that are at once vivid and ambiguous, arcane and accessible, and creepy and strangely sublime. Heady enough? The truth is that though there are whole lot of wild animators out there, the Quays are singular in their field—there isn’t anybody out there doing what they do, creating what they create. The Blu-ray collection offers 15 Quay Brothers shorts, including their best-known film films The Cabinet of Jan Svankmajer (1984), Street of Crocodiles (1986), and the Stille Nacht series (1988-94) that was originally commissioned by MTV. All look wonderful in their Blu-ray incarnation—detailed, textured, archaic and instantly recognizable as the work of the Quays. There are also three recent Quay productions that are making their disc debuts here: Maska (2010), Through the Weeping Glass (2011) and Unmistaken Hands (2013). Also included is the new short film Quay by Christopher Nolan (Interstellar), a dedicated fan of the Quays who here observes the twins in their sorcerer-like workshop alongside their puppets, miniatures and, of course, a camera.